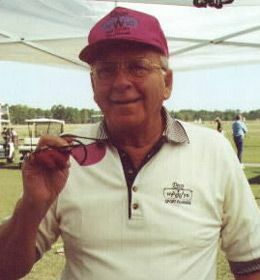 Sports Optics - Bud Decot founded Decot HY-WYD over 50 years ago. When you want the best, you buy Decot HY-WYD. Bud Decot founded Decot HY-WYD over 50 years ago. When you want the best, you buy Decot HY-WYD. Bud, at the Quail Unlimited shoot in Savannah, Ga. checks the "Optic fit" of a customers gun. He finds that a large number of shooters have their stocks to low, that makes them to take a loose cheeking on the gun. They can never be consistent in the way they cheek the gun and their scores reflect it.Have someone do as Bud is doing; look from the muzzel; of an empty gun, and see where the center of your eye is when you mount the gun. You mount the gun with your eyes closed, then open them and a lot of you will find out why your scores are inconsistent. At this point this is a page in progress. When I can figure out a way to get the graphics I'll put it all together so it is usable in this format. Until then, please call / fax / e-mail your requests / orders to me, and I will do all I can to help. BRILEY CHOKES, the first major, after market screw-in choke manufacturer, and the best in most opinions. The latest reloader from P/W with all the extras you asked for. Currently available in 12,20 & 28 Ga. Weights added to a shotgun to give it the right "Feel" and improve the "Swing" of the gun. Available for O/U and semi auto's in a varity of weights.